Border Patrol gets the Fast Forward. Art & JJ finish the Fast Forward. Make their way to the next pit stop. WOW. Keri & Stacy are so far behind! They arrive at the roadblock after Art & JJ finish the FF. Rachel says she will get last if Brendon continues talking to her like that. Now how did Brenchel get the clue? And they have no idea what the clue says. And Brendon boasts that he has a bunch of degrees. Shut up. Stacy does the roadblock. They're out of the roadblock in 7th. Mark: They don't speak no English, my brother." Joey & Danny. Davechel gets their clue. Vanessa & Ralph get it. Nary & Jamie. Davechel and Joey & Danny ask where the place on the coin is. And they know where the're going. Dave flips off Rachel as they're lost. That's not smart. Brenchel aren't the only ones arguing. Davechel are too! Except they're being civil about it. Rachel: Are you going to quit your PhD too? Brenchel continue to stand at their car and not move. This. Is. Tremendous!! Yep! I didn't understend that, but ok! Team Pink arrives at the museum while Brenchel continues to argue and not move. Let other teams pass you! Keep still! Brendon figures out that the place is on the coin. Brendon doesn't know where to drive to. Rachel: I don't know, I don't live here. Keri & Stacy arrive at the museum. Brenchel have left by then. Bopper & Mark are at the roadblock. Bopper does the roadblock... and they're done. Art & JJ first. Ho hum. Jersey Shore think it's first. Um. No. Detour. Clean That Statue or Name That Salami. I love this. Art & JJ get first by landing a dumb helicopter. What a disgusting FF. They're team #1 and they get $5000. Joey & Danny take an elevator up the building... And they start talking about the lady in the elevator with them. Name salami: Taste 14 salamis and identify them all. Joey & Danny pick statue. Davechel pick statue. Phil : Name That Salami requires teams to... (points to salami) Name, that salami! The teams are loving the Park Assists on their Ford Foci. Oh, Rachel's crying and running away. Just shut up. 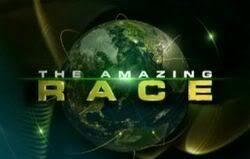 There's no crying in the Amazing Race. Ralph has fun with the park assist. Nary & Jamie pick statue. Brenchel are arguing some more. Aye. Vanessa & Ralph pick statue too. Brenchel pick salami? Brendon calls Vanessa & Ralph the ogre and the triflin' ho. Vanessa says the green team eats salami... or something like that. I love this drama. Rachel: "I know salami is on pizza." Bopper and Mark see the girls! Vanessa and Ralph too, are Fitness Team lost? ?